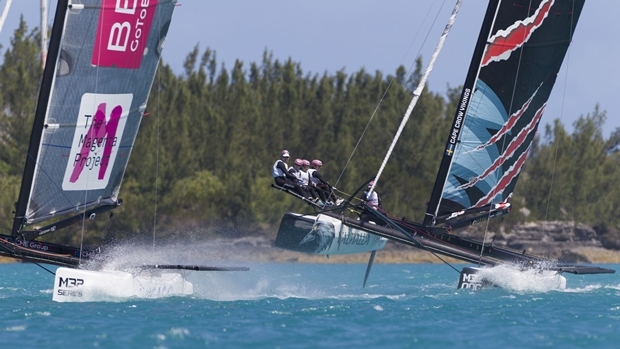 After four events and over 55 races, Don Wilson and his Convexity team have claimed the 2016 M32 Series Bermuda title. The Chicago based team completed the series ahead of the Magenta 32 all-female team skippered by Sally Barkow. The Swedish Cape Crow Vikings skippered by M32 Series founder Håkan Svensson finished the series an impressive third overall. Coming in to the final series event on Friday, the five competing teams took advantage of the fresh spring breeze in Bermuda’s Great Sound to practice before racing started over the weekend. After Convexity suffered damage to their mast on Friday, and rendering their boat unusable, the four remaining owners agreed to a revised racing format which would allow 5 teams to sail 4 boats using a round robin rotation. This unique display of solidarity amongst the owners, and not commonly seen in competitive sailing classes, allowed all the teams to compete in an equal number of races and ensure the success of the final event of the series. With a favorable wind direction on Saturday, the fleet consensus was to adopt the “stadium sailing” strategy in Hamilton Harbor just off the seawall of the famed Hamilton Princess Hotel. Three tightly packed, high action races were completed which delighted both racers and spectators from the hotel and on boats flanking the race course. Despite the short courses on Saturday, heavy ferry and barge traffic caused a few lengthy delays causing sage PRO Mattias Dahlstrom to move the Sunday race course back to the familiar waters on the Great Sound and to complete the final 8 races of the series. With a stiff NW wind in the 15-22 kt range, the 4 boat fleet resembled a tightly packed school of fish around the course, showing once again how competitive and even all the M32 teams have become. Showing an impressive learning curve, M32 newcomer Mark Watson jumped into racing with little catamaran experience and after finding his way on Day 1, put the fleet on notice that he and his team were not to be taken lightly in the standings. Winning races and pushing hard in others, it was a successful first event for Watson and his team, and most likely will not be his last M32 regatta. Almost like flipping a switch, and in her second event of the Bermuda series, longtime racing skipper Deneen Demourkas and her Groovederci team found their form on day 2 of the event, leading at marks and taking clinching valubale wins on Sunday. Mixing it up with the top teams, Demourkas showed great ability to transfer her monohull skills in to the M32 without missing a beat, and if her inklings about the summer schedule were any indication, the M32 fleet will hopefully see her in Harbor Springs, Michigan later this summer. Despite some gelcoat being swapped on the racecourse, the inaugural M32 Series Bermuda has been a great success with a friendly camaraderie between owners and crew over the four-month winter series. The M32 North American circuit continues in Newport, Michigan and the West Coast of the USA this coming summer as the fleet continues to gather pace and welcomes new owners to the M32 World.